“THE CUSTOM OF THE ARMY” will be released as an e-book on MAY 21! Click to pre-order from Amazon, barnesandnoble.com, or the iBookstore! Well, now. Over the last few years, I’ve written occasional short(er) pieces for anthologies. An anthology, for those unfamiliar with the term, is a collection of short stories or novellas (a novella is shorter than a novel, but longer than a short story), written by a number of different authors. The notion behind an anthology is that readers who tend to read only within one genre will buy an anthology that features one of their favorite authors, but then will be exposed to other fine writers whose work they may want to explore further. From my point of view, it’s just fun—and a nice mental break—to do these occasional short bits (I always do have multiple projects on the go; it keeps me from ever having writer’s block). As a side benefit, though, I then _have_ these pieces. See, unlike the standard contract that covers publishing a novel (which normally says that the publisher can publish the book as long as it keeps selling above a certain minimal level), editors/publishers of anthologies normally make short-term contracts with their authors; they have the exclusive right to publish the story within a particular territory, but only for a relatively short period—after which, the rights to the stories revert to the individual authors. So. What do you _do_ with, say, a 23,000-word novella? Well, prior to the advent of e-publishing, not that much. Unless you could collect several short pieces and publish them together as a book, that is. I did this with the first three Lord John novellas (“Hell-fire Club,” “Succubus,” and “Haunted Soldier”), which I (and Random House and a number of other, foreign publishers) published as a single volume titled LORD JOHN AND THE HAND OF DEVILS. BUT…bear in mind that bit above, about rights. The publisher of an anthology does have an exclusive right to publish a given story, within a particular territory, for a set period of time and/or in a particular form—and you can’t publish that story elsewhere until those rights expire and “revert” to you as the author. Now, some of these stories have already reverted to me, and some haven’t. Some will revert in one territory sooner than they will in another. Those that haven’t yet reverted will do so one by one, as their original contracts expire. What this means is that while I could publish “The Custom of the Army” right now, anywhere, in any form I liked, I can’t publish “A Leaf on the Wind of All Hallows” until this October—and “Plague of Zombies” doesn’t revert to me in North America (the US and Canada) until next April. So. What we (my agents and I) have arranged to do is to e-publish the novellas with Random House (my usual novel publisher) in North America one at a time, as the rights to each one become available. Once all of the rights have reverted, we’ll be able to put the entire collection in the form of a printed book (and probably a larger e-book), but I didn’t want y’all to have to wait two years before getting any of these stories. HOWEVER—“The Custom of the Army” will appear first in North America. It will be released as an e-book, on May 21st (that’s a month from now—mark your calendars )**. “A Leaf on the Wind of All Hallows” will be published as an e-book in North America in October, “Plague of Zombies” in April, and so on. I hope you’ll enjoy all these stories, in whichever form you encounter them! *Because of the rights issues, A TRAIL OF FIRE won’t be published in the US/Canada until all of the story rights have reverted in this territory. This doesn’t mean you can’t get the book, though; just that it will be a bigger nuisance. The book can be legally imported from the UK, so you would—for instance—be able to order it from amazon.co.uk, or the Book Depository, or to buy it from an independent book-seller who imports UK books (The Poisoned Pen does import British books regularly; if you order from them, you can also get the book signed. www.poisonedpen.com). The drawback, of course, is that it’s a lot more expensive, owing to the high price of British books and the shipping costs. The e-books—being e-books—will be pretty cheap, so you might want to just get these one at a time as they come out. If you truly can’t wait, though…you will be able to get the whole collection in print form in October. 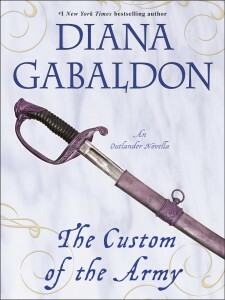 **Since it’s very easy to include additional material in an e-book, “The Custom of the Army” will include introductory notes, Author’s Notes about the historical details of the story, and a complete “Chronology of the OUTLANDER Series,” which tells you where ALL the novels, novellas, short stories, etc. fit in relation to each other, and what time periods are covered in each one. Such a deal! Thank you for clearing that up for me. I can hardly wait for the next book of Claire and Jamie as well as Brianna and Roger and the children. I’m having a great problems in finding the latest releases on iBooks here in the UK. Is there a different release date for the UK? When the attac on Ticonderoga takes place, a welsh lieutenant gets the scalp of his girlfriend,wich the indians has killed. Why was she at fort Ticonderoga? Did he knew that his girlfriend was there at all ? You’re the best author ever !!! I am a book person. I don’t get the e-reading fascination, I love books. So glad you decided to try out writing! Where would we be with out the Frasers, Mac Kenzies, Lord John and all the rest of our favorite characters…Can’t wait til it comes out, but since I just finished An Echo in the Bone about a week ago…I’m waiting along with everyone else to find out what happened to everyone that was left hanging in the end….. I LOVE BOOKS TOO,…..BUT, that being said, there is something to be said for being able to carry ALL of Diana’s books in something so handy as my Kobo AND my SONY readers!! You NEVER know where you may be stuck in lineups, waiting rooms, traffic jams…etc.!!! I love the Poisoned Pen, they import a historical fiction series for me all the time (Morland Dynasty) that has 34 books so far. They will even let me know if the markup will be exorbitant and let me know that Amazon in that case may be a better choice. AND they always have all DG’s books in, signed editions etc, artwork prints. Pretty cool place. They all read, know books and have recommended some really great reads. I would definitely suggest using them if you do want to use an importer, or if you live local and just want to check out a great store with a really knowledgeable staff. You don’t have to worry about the blank stares when you ask a question, as you would at a B&N store. Well, damn I have a friend leaving for AU next month and at first thought about having her get me a copy. But went back and reread and realized you indicated publishing wouldn’t be until October. Any update on USA publication, its Sept 2014 with Amazon showing Aug 29 2014 as a pub date. Er…publication of _what_, exactly? MOBY (aka WRITTEN IN MY OWN HEART’S BLOOD) was published June 10th, 2014. I don’t have anything else coming out that’s been announced with a pub date, so far as _I_ know. Guessing you are busy, off chance I just slipped off radar, I am asking about the USA release of the Trail of Fire collection in paperback. Amazon was showing publication date of Aug 29 2014, but still nothing in the USA only UK sellers. Oops, forget to say Trail of Fire the collection of 4 short pieces.